Monday, April 20. Windshield replaced - check. This is the week to get the car in shape for traveling. The windshield was so pitted that I put in a claim to get a new one and it cost me nothing (not true - $22/year for the coverage on my insurance) plus I got 4 free movie tickets out of it. Not bad! I had a crappy night of sleep and woke up with itchy red welts on the back of my left leg. I have no idea what caused the, but it could have been bug bites as I sat under the trees in the back yard for a while yesterday. Thursday, April 23. The itchy blotches on my leg must be a reaction to the Cipro that I have been taking for a UTI. When I called the doctor back on Monday regarding the rash, I learned that Cipro will not work on the Infection that I have and the prescription was changed. Today, I still have the rash (treating with oral and topical Benadryl, hydrocortisone cream, baking soda and vinegar soaks) but nothing seems to be working and will have to call again tomorrow. Grrrrrr! 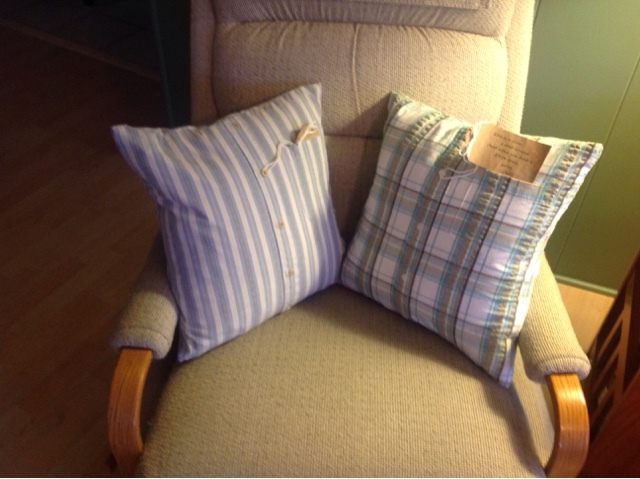 I worked on a sewing project today and made 2 pillows from Mike's shirts that I will give to Pat and Ben. A tag in the pocket says "This is a shirt I used to wear, and when you hold it, I'll be there. Love, Dad". They turned out very nice, so I made one for myself too but have to buy a pillow form for that one. I can check that one off my list. Saturday, April 25. I was contacted earlier this week by a person interested in seeing my house this morning. I'm got up and got everything spiffed up and they never showed up. Oh well, I guess I'm sticking to plan A. This rash on my legs is driving me nuts. I almost had a panic attack last night, thinking that it was spreading to other parts of my body, but the Benadryl I've been taking knocked me out and I was able to get a good nights sleep. I did wake up itchy again and have been wiping it with a vinegar water solution off and on throughout the days taking the B every 4-5 hours. The puffiness and tenderness are better, redness remains. I just went to take Frisco out for a walk and it is really cloudy and windy here. We got a lot of rain yesterday and it looks and feels like more is on the way.